Amelia Island was my first simulator, predating and essentially the catalyst for what would later become the Irukandji Continent. Amelia Island was also where I first met the people who would later become my estate managers. 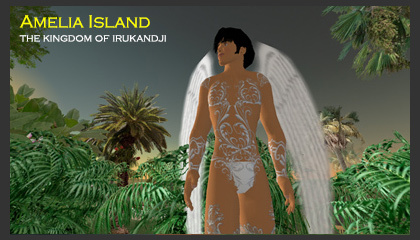 These were the days of Second Life v1.0. In reflection - and all gamers feel this way when they look back at early versions - everything appears very cartoonish, but at the time, it was state of the art. I built my first art gallery and mall on Amelia Island. This is also where I started designing clothing and buildings, and had my first taste of scripting. On the beaches, I offered rentals in a resort I named Chez Xay, and six hundred metres overhead, I built my first club, called CX600. A few months later when I bought my first sim, Tamita Island, the Chez Xay name would continue there, and the club would be renamed Lava. Below you will find some photographs of Amelia Island that I took during my travels around the islands.